I'm a real animal lover - you probably noticed from my Etsy shop alone! I was brought up around animals and have had any number of different pets, and it's mostly animal charities - aside from the Multiple Sclerosis Society - that get my money above others. So I love animal gifts - I love to give them and get them; if it has an animal on it I'm more likely to look at it in a shop. It's just what my eyes are drawn to. So I decided to put together this gift guide for animal lovers - lots of animal themed gifts, most with practicality and some are just simply nice ^^ Hopefully you'll see something someone you know will love and be able to check them off your gift list! This stag plate set makes a wonderful gift for animal lovers, a wonderful way to brighten up dinner with a fabulous stag and owl illustration extending from one plate to another which is undoubtedly a unique design placement! There are also other designs available. Vivid Arts is a garden decoration company, but in truth their products are so good most of them live indoors. My dad is a particular fan of them because they're both affordable and quite realistic. I can't count how many he has! Having said that, he's bought a few for me in the past, including a realistic and life-sized ferret statue, a small donkey, a mouse, and even a dragon! They're extremely fantastic quality, and this resin fawn ornament is no different! I think it looks gorgeous! In short, Vivid Arts make for wonderful gifts for animal lovers without breaking the bank! 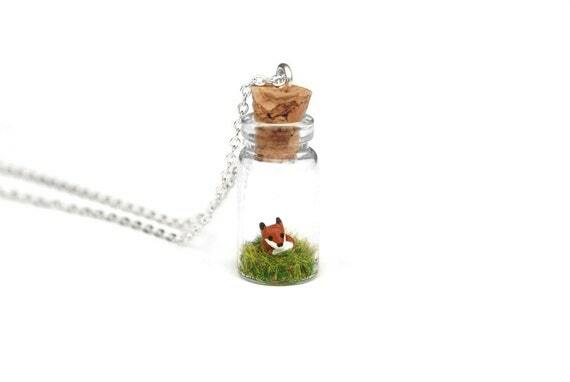 Animal loving ladies will love a piece of animal jewellery, and this fox in a jar necklace is a best seller! The jar measures just 2.5cm tall and the fox itself is about 6mm in size, and there are many other animal necklaces available as well as a few novelty Christmas necklaces! So there's a gift for every animal lover this Christmas! These needlefelted animals are sickeningly good! The needlefelted degu initially caught my eye, but the cats held it, in short because I'm still searching for a Christmas gift for Seeg's parents. 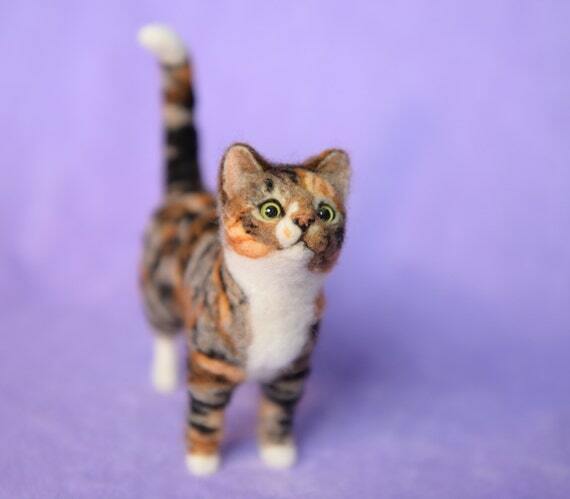 This needlefelted tabby cat is just wonderful and stands at a tiny 4 inches! There are all kinds of other animals - dogs, deer, owls and so on - and they're all just as good as the last. Needlefelted animals would make wonderful Christmas gifts for an animal lover's mantle! You may have noticed that I've fit chocolate into almost all of my gift guides this year, and that's simply because it's the law. So for animal lovers, why not these chocolate dogs? A box of 6 dog-shaped chocolates as either labradors, dachshunds or spaniels, so it's perfect for lovers of big dogs, small dogs and the best medium dogs and lovers of chocolate! Animal adoption packs make a great gift - they capture the imagination with "I wonder what it's doing now?" and 'owning' a piece of the wild, and they can also be a great way of sparking greater interest and awareness in wildlife in general. There are plenty of different adopt an animal gift packs out there, and this adopt a meerkat pack is pretty great. It's a meerkat! And no, I'm not hopping on the Compare The Meerkat bandwagon because I've always loved the funny little things, so this was my representation choice. Look at the little guy! These animal adoption packs are 'better' than getting them a real pet, too - it's cheaper, cleaner and free of responsibility, so it's ideal for kids. Now, let's get a little more 'real'. Most charities have little online shops filled with cards, biscuits and gifts, and most, if not all, profits made from the sale of such items goes to the charity in question. So, I thought it would be a good idea to finish this animal lover gift guide off with some animal pieces with the added bonus of aiding an animal charity. So, from the RSPB shop, I picked this Forest Friends espresso set. The RSPB (Royal Society for the Protection of Birds) works to save endangered birds as well as provide conservation areas and safe havens for birds of all kinds, and they have a number of parks around the UK you can visit for a day out, go for a nice walk and look at all kinds of ducks! In fact my recent gallery exhibit was hosted in one such location and proudly raised a good amount for the charity itself from art pieces sold in the event. Puzzles make wonderful gifts for peaceful people, but with 'impossible puzzles', it's likely that they won't stay peaceful for long. This border collies impossible puzzle is one of a number of dog puzzles found in the Dogs' Trust shop, and it will doubtlessly take some time to finish - though perhaps not as long as the chocolate labrador one! The Dogs' Trust is dedicated to rescuing and rehoming dogs. And from the RSPCA shop, I chose this wonderful robin nester teapot! A great gift for wildlife lovers and bird watchers, as well as adding a gorgeous touch of whimsy to the garden! It's a great gift for anyone who loves birds and wildlife, The RSPCA (Royal Society for the Prevention of Cruelty to Animals) works to rescue animals of all kinds and bring them to health, as well as being the authority against animal cruelty.